Youngster Rusty Hickman is set to step it up in the 2018-19 season, with the youngster currently preparing for his maiden season on the road as a World Series Sprintcars Championship contracted driver. Having last season become the youngest driver to win the overall Eureka Garages & Sheds Series point standings, the 18-year-old has shown plenty of promise throughout his first two seasons in Sprintcars, but it’s his composure and consistency that he plans to improve on as he undertakes this massive new challenge, which will see him contest the 10 rounds of World Series in his home state of Victoria, along with venturing to rounds in South Australia, Queensland and Western Australia. Joining some of the biggest names in Australian 410 Sprintcar racing, the Bendigo, Victoria-based racer sees his first World Series campaign as an opportunity to learn as much as he can as a driver and visit the tracks in Western Australia for the first time, and he couldn’t be more excited about this opportunity. “Hitting the road with World Series Sprintcars is a massive step for my family team and I, but it’s one that we are all very excited about,” expressed the pilot of the Vic # 40 Peerless Products Pty Ltd / Hickman’s Tree Maintenance supported J&J car. 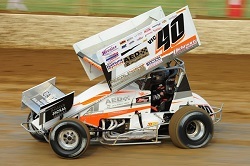 In addition to his World Series Sprintcars duties, Hickman also plans to contest as many race meetings throughout his home state as possible, which includes the Grand Annual Classic at Warrnambool’s Premier Speedway, along with the possibly competing in the Australian Championship at Brisbane’s Archerfield Speedway in Queensland. This Saturday night’s opening Eureka Garages & Sheds Series round at Geelong’s Avalon Raceway will see Hickman and the team commence their busy 2018-19 season. Hickman is proudly supported in the 2018-19 season by: Peerless Products Pty Ltd, Hickman’s Tree Maintenance, Jackal Fencing, Camden Signage & Building Services, J&J Auto Racing, Victory Lane Racegear, and Choice Graphics. Special thanks must go to Sandie and Darren (mum and dad), Amy and Olivia (sisters), and Frog (crew member). To find out more about Hickman and his team, LIKE them on Facebook by searching Hickman Motorsport Vic 40.